Boy oh boy do I have a treat for you readers today! My drop dead gorgeous sponsor Sara from Chalk White Arrow is offering a $75 gift card to her light shop (you can see some of her lovely work here). She makes the sweetest hand wrapped, pendant lights. They are so unique and would make any living space stand out. Contest is open worldwide. One lucky winner will be selected and notified via email on September 19th. Thanks friends and good luck! Congratulations Megan, I will be contacting you in the next little while so look out for my email! As for everyone else, thanks so much for entering and supporting my blog! I like the edison light bulbs. Follow you both and commented!! Really hope I win! These lights are lovely! 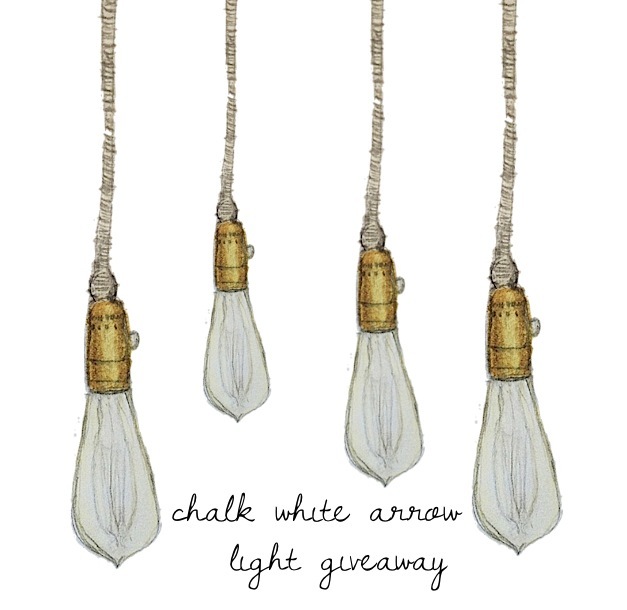 Never heard of chalk white arrow light before... love her stuff! i hope I win! I love funky lights, it would take me time to browse! I love the pendants you posted! I like them both but especially light two! I'd go with the light dimmer cord...and probably some Edison bulbs! What a super creative and fun business. Those lights are so lovely! so pretty. i would choose light two! Cute blog! Love the edison lights! The half bath (more like a tiny closet with a toilet) in my 1940's apartment has a super high ceiling, I know one of these lights would be the perfect touch and give this little space the pizazz it needs and deserves. I love light one and the Edison lights! Hi Lou!Thank you for following! I followed you through GFC in both blogs. #1476 #1257 under MelHon. Followed you on Bloglovin and Twitter also!Thank you so mucH!! !you have a great blog! The page tells me that the shop is closed right now. Perhaps she has more things available, but my favorite of those that are pictured are the Edison light bulbs! Thanks for the chance to win! Following on gfc as bohohippiemom. Lori d.
I've been trying to win one of her lights :) So hard to choose though!